Want to adopt a pet? Well, here's your chance! 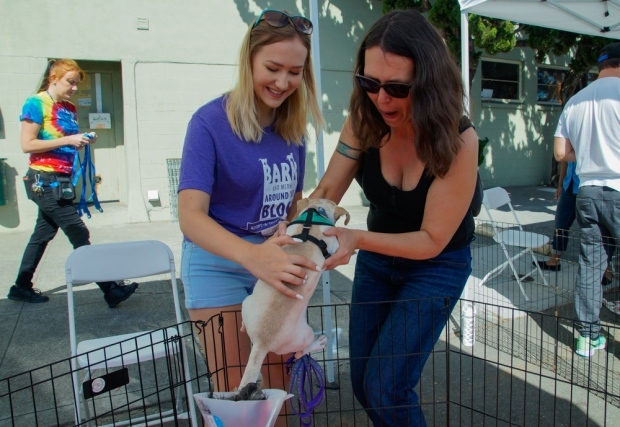 NBC Bay Area and Telemundo 48 teamed up with more than 45 animal shelters in the Bay Area, and kicked off the second annual Clear the Shelters event Saturday. Participating animal shelters offered no-cost or reduced fee adoptions or waived pet spaying and neutering fees. Many shelters also stayed open later so animal lovers could take home dogs, cats, rabbits, hamsters, guinea pigs, miniature pigs, and a few cockatiels. Even pigeons that have special needs and are unable to live free were spotted Saturday. Prince, a bird that suffered a broken beak, but was saved from euthanasia, sat comfortably in the arms of a shelter volunteer wearing pigeon pants. 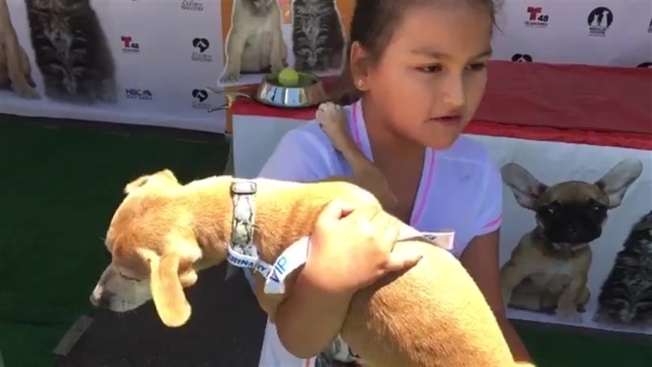 In partnership with Berkeley Humane, NBC Bay Area and Telemundo 48 hosted “Clear the Shelters Adoption Row,” a family-friendly pet adoption block party, at the corner of 9th and Carleton Streets in Berkeley from 10 a.m. to 4 p.m. More than a dozen animal welfare groups attended the largest gathering of adoptive pets in the Bay Area, after more than 125 pets were adopted at this single location last year. This year, 105 pets from Berkeley Humane alone are up for adoption. That number is sure to rise when other rescue groups are added to the mix. Canine namesakes of NBC Bay Area anchors and reporters, including Raj Mathai, Peggy Bunker, Scott McGrew, Marianne Favro, Sam Brock, Jeff Ranieri, Laura Garcia-Cannon, Ian Cull and Mike Inouye, were on hand. Meanwhile, kittens were named after Janelle Wang, Diane Dwyer and Christie Smith. Over in San Francisco, the SPCA noted that more than 100 pets had been adopted over the course of the day. A 12-week-old Spaniel-mix, named after NBC Bay Area investigative reporter Vicky Nguyen, was taken home by a couple Saturday. 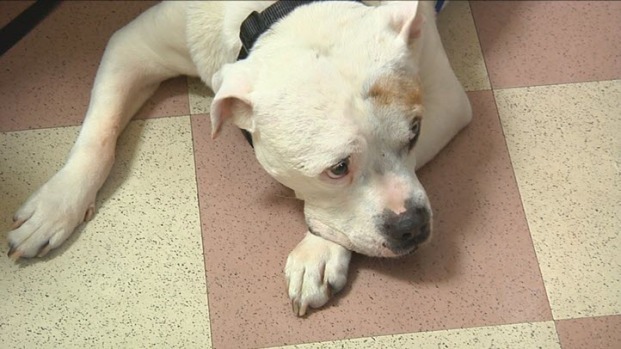 "We saw her face and fell in love," they said, armed with free dog supplies, food and toys. Elsewhere, community members searched for companions for their pets while others hoped to convince their parents to let them take home a cute furry friend. Loreen, who had fostered a litter of kittens for a few weeks, came to Berkeley to adopt 2-month-old Moscow. "We just couldn't ler this one go," she said. "So we are taking her home." The Bay Area on Saturday will come together in an effort to find new homes for pets living in community animal shelters. While young kittens and peppy puppies get most of the attention, it's important to think about giving a second chance to a more experienced friend. Raj Mathai reports. Clear the Shelters is a nationwide pet adoption initiative featuring 400-plus shelters in 20 states, Washington, D.C. and Puerto Rico. By 6:30 p.m., more than 19,600 pets had found forever homes during this year's one-day adoption drive. Of them, more than 3,483 are in the Bay Area. The tally, between July 1 and 23, has hit 45,000. The goal is to #ClearTheShelters by finding forever homes for as many animals as possible. Over 19,000 pets were adopted during last year’s event, but millions more remain homeless. Every year, 7.6 million animals end up in shelters nationwide — and only 2.7 million are adopted, according to the ASPCA. A slew of shelters will be continuing #ClearTheShelter and waiving adoption fees on Sunday, including the San Francisco SPCA, Berkeley Animal Care Services, Peninsula Humane Society and SPCA, and San Francisco Animal Care and Control. You can also find a local furry friend by using our interactive map to find the shelter closest to you.